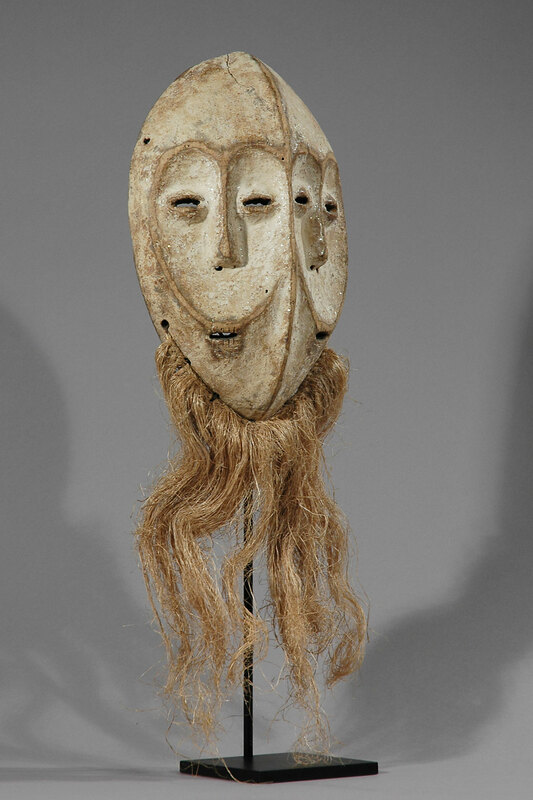 Among the Lega (also called Rega, Barega or Warega), in eastern Congo, the Bwami society presides over the tribe’s social and ritual life (6 ranks for men, 3 ranks for women). 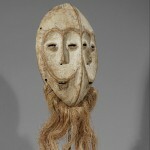 There are small miniature masks, called ‘Lukwakongo’, that serve as ‘badges’ of the Bwami society. 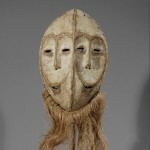 Larger face masks, such as the present one, are reserved for the male members of the highest ranks of the Bwami society (‘Yananio’ and ‘Kindi’) and worn, or used in dances during the society’s ceremonies. 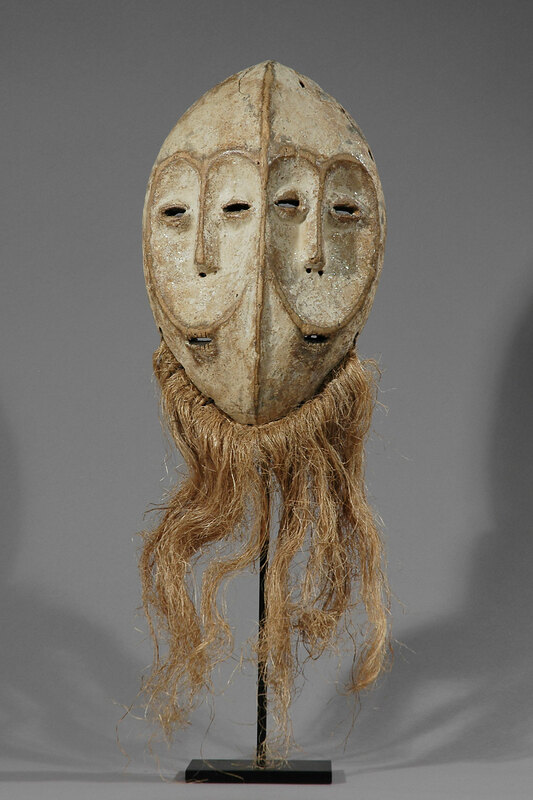 The present, large face mask of the ‘Idimu’ type is a rare peculiarity: a double mask with two faces such as the present one is manufactured when in a Lega village two male twins achieve the highest Bwami rank ‘Kindi’. 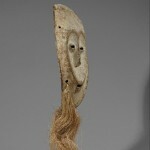 It is an interesting piece made of light-coloured, lightweight wood, with two typical, heart-shaped Lega faces, almond shaped eyes, long, narrow noses and small mouths. 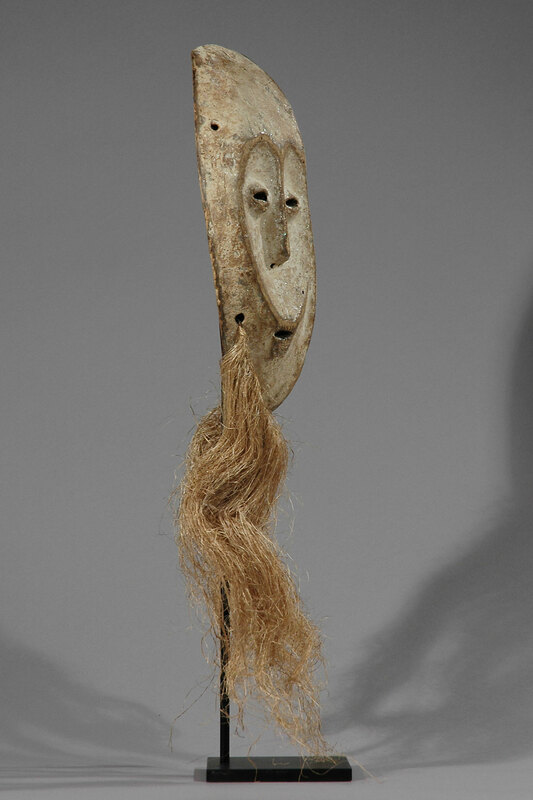 It is dyed with white kaolin and adorned with a light-coloured fibre beard attached to the chin. 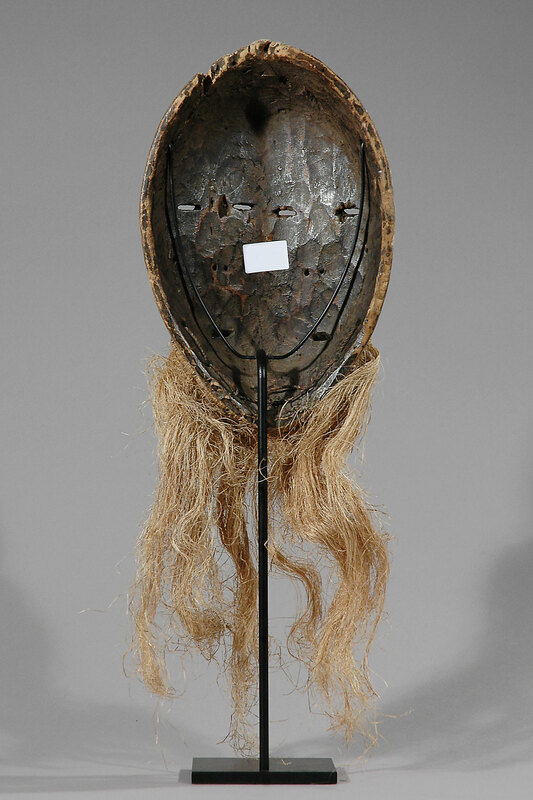 The back of the mask is dyed black and it has a fine shiny patina and shows signs of use. 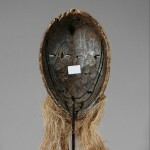 It has a minor damage due to its age on the upper part of mask (a partly glued old crack and a minor tear). Age: First half of the 20th century (before 1950). Provenance: Originates from a Dutch Collection. Then sold to a private Belgian collection. Litterature. : ‘Het gelaat van de geesten. 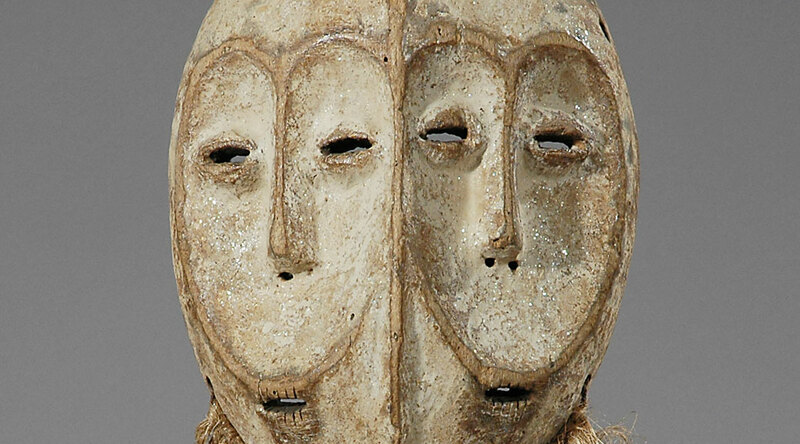 Maskers uit het Zairebekken’ by Frank Herreman & Constantijn Petridis, fig. 98.